Mega Sale! 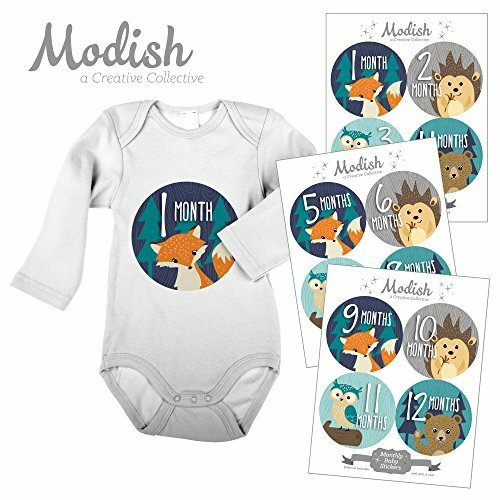 Save 27% on the Modish Labels, 12 Monthly Baby Stickers, Baby Boy, Woodland, Baby Month Stickers, Fox, Bear, Hedgehog, Owl, First Year Stickers, Baby Book Keepsake, Photo Prop, Baby Shower Gift by Modish Labels at Kmpacting Studio. MPN: MC0109. Hurry! Limited time offer. Offer valid only while supplies last. Each colorful bodysuit sticker measures 4 inches across, and is professionally printed on the highest quality matte glare-resistant paper available. Each colorful bodysuit sticker measures 4 inches across, and is professionally printed on the highest quality matte glare-resistant paper available. The ink is plastic-based from professional printing, making the sticker image the highest quality possible, and drool-proof. The sticker will not easily tear or crinkle. Capturing your the monthly milestones of your baby is fun and memorable with these custom-designed peel and stick graphics. An accessory for your monthly photos, and keepsake for the baby book - these make perfect baby shower gifts and presents for the holidays. This set includes 12 monthly baby stickers, and arrives packaged for gift giving. We know you are excited about your order, and we are too - that is why we ship your order within 24 hours! Makes documenting your baby's monthly milestones fun & special. Made in USA: Matte Glare-Resistant & Laser Printed. Peel, Stick & Click! No cutting required. If you have any questions about this product by Modish Labels, contact us by completing and submitting the form below. If you are looking for a specif part number, please include it with your message.